I often frame my political opinions in terms of good vs. evil. I tend to only read and share articles from specific media outlets. I’m not really interested in the other side. When I comment on (or about) others’ posts, I use words and phrases like: idiot, crock, farce, TOTALLY disagree, stupid, ____-wing agenda, fool/foolish/fooled, shame on you, and stop-just-stop. My online comments have a harsher tone than my in-person conversations. When people disagree with me, I tell them off and set them straight! 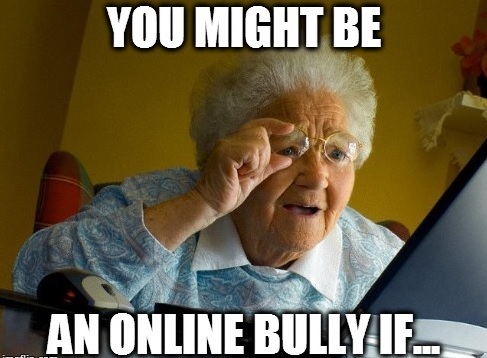 If you are an online bully, spend some time reflecting on why. And then look for my thoughts about possible reasons why–in an upcoming post.